I sit on the couch in my home while browsing the Internet on my laptop. My home also happens to be the place where I work as a Resident Assistant at a shelter for asylum seekers. A young man walks into the room and asks for his mail, which I distribute for all the residents. I hand him the letter and return to my computer, thinking nothing of it. He makes a phone call and starts speaking in his native Ghanaian language as he sits in a chair and opens his mail. I’m unable to understand him as he speaks, but then I hear the words “green card” and look up. Across from us is a seven-year-old Congolese girl watching TV as her mother watches YouTube on a computer nearby. They both turn to look at the man. The 19-year-old from Ghana who fled his home country, traveled through Brazil, Central America, and Mexico, and was imprisoned in immigration detention for four months after applying for asylum, dances and jumps around the room in joy while repeating the first line of the letter to himself over and over again. The Congolese girl looks at him curiously, confused as to why the man is so happy. She sees him give me a hug. 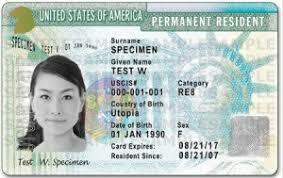 Then he walks over to her, squeezes her tightly and shows her his green card. Green card, officially known as a Permanent Resident Card, allows you to live and work permanently in the U.S.
“Let’s go out and celebrate. I’ll buy you ice cream,” he says to the girl, whom he once told me reminds him of his little sister in Ghana. He walks over to the girl’s mother. The girl and her mother presented themselves at a port of entry in Tijuana a year before and were one of the first families who were separated under the Trump administration. The ACLU took their case, and after five months they were reunited. The mother is quiet and doesn’t talk much. She spends most of her time alone watching YouTube videos from Congo. The man shows the mother his new green card and says that they’re the papers for him to stay in the U.S.
It’s the first time I see her smile. As I sit in the room and watch this moment unfold, I’m reminded of another man whom I also once saw dancing in a room with a strange piece of paper clutched in his hand. I was five years old. My father was dancing. I had never seen him dance like that, with his arms raised about his head and bouncing up and down. At the time I didn’t understand what the significance of that little paper would have on our family. How different our lives would have been without it. Later that day I call my father and tell him about the moment I witnessed and how nice it was to be in the room when this 19-year-old got his green card. My Indian father wasn’t an asylum seeker. He didn’t flee a country that was trying to kill him. Yet, he had his own struggles. He arrived in the U.S. on a work visa. His mother sold all her belongings to pay for his education. His father’s father was killed in World War II after being forced to fight for the British colonizer. I doubt I’ll ever be able to fully understand everything my father endured to create a new life in the United States and give to his children what he never had. I got a little closer as I watched the happiness radiating from this man from Ghana. What struck me in this moment is how in the grand scheme of things, my father and this 19-year-old guy from Ghana could not be more different. What unites them is a common experience of assimilating to America and a common feeling of joy expressed through an apparently universal green card dance.